Waterjet machines come in a variety of sizes, from small ones that fit into one corner of a workshop to large ones that completely fill a workshop. Machine size is typically measured as the size of the area where the material to be cut is placed. Note that the cutting area (the area that can be cut with the waterjet head) is usually slightly smaller than the bed (you don’t want the waterjet head cutting into the sides of the machine). So when a machine is referred to as a “4 ft by 4 ft (1.2 x 1.2 m)” machine, that is not the total size of the machine, but the size of the cutting area. Typically, machines are made to suit standard material sizes to simplify loading. Waterjets are machine tools and even a “small” machine requires industrial levels of power and water supply not found in a home workshop. Small waterjet machines are smaller than 4 x 4 feet (1.2 x 1.2 m) in size and they are only used in small workshops. 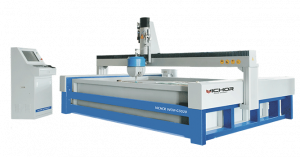 Medium waterjet machines range from 4 x 4 feet to 4 x 8 feet (1.2 x 1.2 m to 1.2 x 2.4 m) in size. These are typically purchased by workshops who do larger work, or simply want a machine that is large enough that they can fit big sheets of material to reduce the time spent loading and unloading material. Large waterjet machines can fit material that is 8 x 16 feet (2 x 4 meters), or larger. They typically run multiple cutting heads, and are used in high production environments. Large waterjet-only job shops and laser shops are typical buyers of such machines. Custom waterjet machines are built and designed for specific purposes. In some cases, they are built into a production line, so that the material is constantly moving past them as they cut. Custom machines are used for automotive carpet cutting, diaper cutting, food cutting, eye surgery, mining applications, and cardboard box making (if the material moves quickly enough it doesn’t have time to get wet). 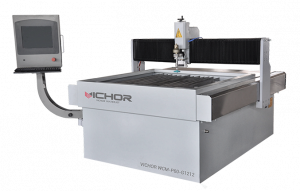 VICHOR Waterjet, top one in China’s water jet cutter market, can supply you almost any waterjet machine size from medium to large.